After graduate school my first job was programming in assembly language for an 8 bit Hitachi CPU. The software would fire infrared light through organic substances to measure the amount of moisture or protein inside. Even at the low level of opcodes and operands, software (and hardware) still presented auras of mystery for me at this early point in my career. Every day presented a challenge and the opportunity for a thrill when bits aligned well enough to work. I’ve largely ignored the Raspberry Pi since it first appeared. I bought one 2 years ago to give my youngest son some inspiration to write Python code. The plan worked. But, I’ve never bought one for myself, and assumed a “been there, done that” attitude. Then one weekend, on a whim, I threw a CanaKit Raspbery Pi 2 kit into my shopping cart. Even though I had been there and I had done that, it was a long time ago. And, those being good times, maybe I could relive them a bit. Growing up in a county with blue laws, I’m still astonished when a package arrives on a Sunday. Who needs delivery drones when sentient employees of the US Postal Service deliver packages with a smile? Thanks to the Windows IoT Dashboard, I had the Pi booted into Windows 10 only 20 minutes after receiving the package. The decision to use Windows 10 was an impulse decision. In hindsight, perhaps not the best decision for what I wanted to do with the Pi. Linux distros on the Pi give a general purpose operating system with the option to apt-get nearly any application, driver, or toolset. Win10 feels like an operating system built for a specific purpose – running Windows Universal application prototypes deployed by Visual Studio. 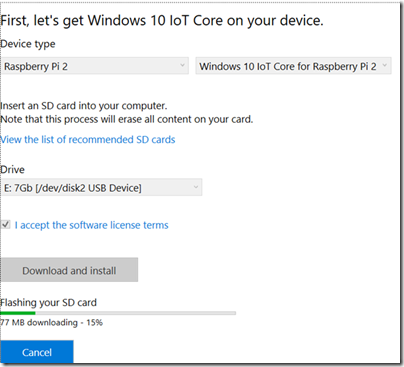 Don’t think of Win10 IoT as Windows on an ARM processor. 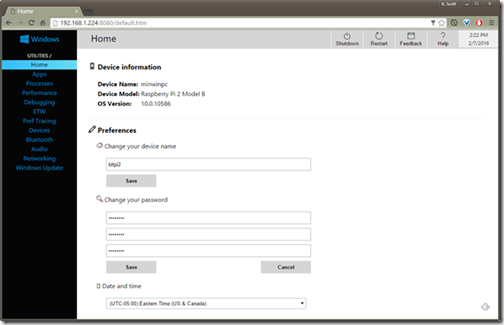 Win10 IoT has no Cortana, or start menu, or even a shell, for that matter. Although, it does listen for ssh connections out of the box. Win10 IoT has limited hardware support and does not support the WiFi dongle provided with the CanaKit I bought. I had to plug in an Ethernet cable before I was able to reach the Pi with ssh. Win10 does support a $10 Realtek dongle, which I purchased days later and works well. If I knew before what I know now, I would have checked the hardware compatibility list up front, but my impulse buys rarely exhibit such caution. You can also connect to Win10’s built-in web site on port 8080. This is the easiest way to configure devices like the WiFi dongle, although you can also run netsh commands through ssh or remote Powershell. Although running a Windows Universal app was tempting, I wanted to use .NET Core (currently dnx) to get some bits working on the Pi. The setup is remarkably easy. The first step is getting some Core CLR bits onto the development machine. The key options here is –arch ARM. Note there is currently an issue here, as dnvm will use the new install to set the process path. Since the path is for an ARM architecture, dnx is unusable until you dnx use a runtime with the appropriate architecture. Then, once you have an application written, be it command like or web application, use dnu (currently) to publish the application, including the runtime. The above command packages the application, including source and the full runtime framework. There output folder will contain ~45MB of files, which is why the --native switch will be useful in the future when it works properly. Deployment is a simple xcopy to the Pi file share, and execution only requires finding and running the .cmd file dnu creates in the approot folder. Working with Windows IoT and the Pi is not quite what I remember from the old days of EEPROM burners and oscilloscopes. It’s too easy. But, there still is some magic in fiddling with a relatively raw piece of hardware.